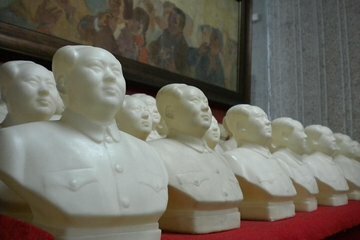 Learn about Chinese political history on this 3-hour walking tour in Shanghai, which includes a visit to the Shanghai Propaganda Poster Art Center and to the former residence of Soong Ching Ling. Only on a guided tour will your hear the stories behind the propaganda and get a glimpse into everyday life during the early communist era. This tour also includes a walking segment in the classical French Concession. I am reaching out on behalf of my friend and I to thanks for this absolutely fascinating tour!! Our guide Alana did an outstanding job in explaining the history and what we were seeing in the propaganda posters at the museum and throughout the tour. We very much appreciated her patience with our endless questions, and especially as we had her repeat a number of times as we were trying to commit the various names to memory. Her openness in terms of the history, the difference in view-points by generation and the government’s actions was so important to really understanding more than just the facade of the posters, and again, so appreciated! Sharing a lunch, the long walk and her openness to spending extra time was what made the entire experience really wonderful. We wanted to see the edgy side of China and this Propaganda Poster Museum was exactly what we were looking for. The booking process was very smooth and easy we booked only 48 hours prior to the tour, and we had an email from our guide, Alana only hours afterwards to reconfirm the details. Although the tour said to meet at a suburban metro station, Alana said she would be happy to meet us at our hotel which helped us so we didn't get too lost enroute! The Propaganda Poster Museum is a bit difficult to find, so this was a god send! Alana was a wonderful guide, very sweet and happy to divulge in information which can sometimes be a little conflicting for other guides. It was a very personal tour and felt like we were being taken around by an old friend which was nice. As some of the sites were slightly apart, she arranged a DiDi Chinese Uber for us to get from place to place and even was happy to drop us off in a DiDi in the French Concession which was about 15 minutes from the finishing point! Great tour and highly recommended to anyone who is keen to learn a little more about the alternative side of China.